Absolutely the most scrumptious concoction ever! Live a little...get sticky. Grab a napkin if you must, but resist the urge to grab a fork...eat like a monkey, use your hands as your utensils. 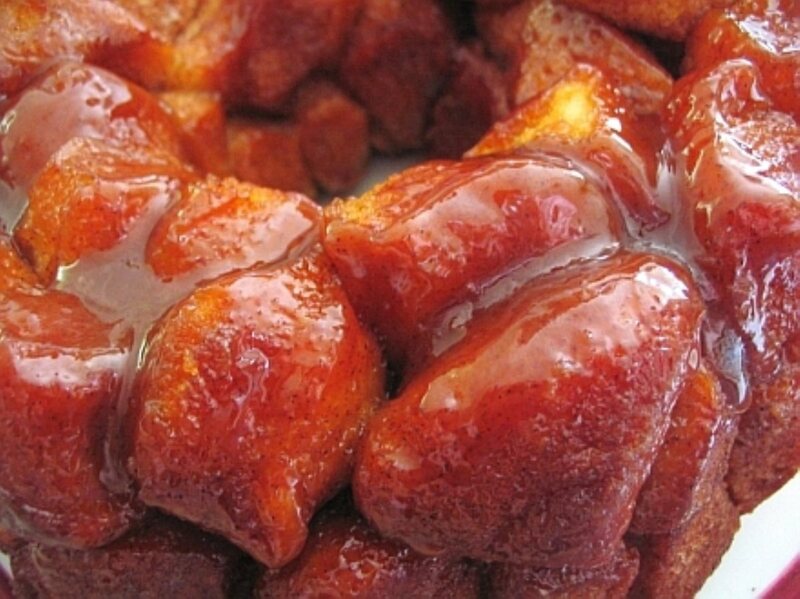 Monkey Bread is well worth the mess every time. Kids love the gooey goodness! Adults gobble up the delicious--hot, buttery cinnamon sugar that melts in the mouth. This simple monkey bread recipe, made with refrigerator biscuits, will please all. Grease, butter or spray a bundt, tube or bread pan; preferably a pan with non-stick coating. Mix 3/4 white sugar and cinnamon in a plastic bag. Cut biscuits into quarters (if using large biscuits like Grands, cut into 6-8 pieces). Shake 6 to 8 biscuit pieces in the sugar cinnamon mix. Arrange pieces in the bottom of the prepared pan. Continue until all biscuits are coated and placed in pan. Do not pack pieces together, but leave some space between the dough pieces. If using pecans, arrange them in and among the biscuit pieces as you go along. In a saucepan, slowly bring milk, remaining 3/4 cup white sugar, brown sugar, and butter to a boil and cook for 1 minute. Pour over biscuits in the pan. Bake at 350 degrees F for 30-40 minutes, or until golden brown on the top. Remove from oven and flip over on to a larger platter. Let sit with pan on top for a few minutes while the sweet mixture runs down the bread. Do not cut! The bread just pulls apart. Makes 8 to 10 servings..